At about 10:30 p.m. on Friday, April 8, 1910, two young gunmen, wearing black clothes and black hats, with black handkerchiefs covering their faces, robbed a saloon at 3725 Central Ave. in Los Angeles. They grabbed $50 in silver from the cash drawer -- but missed about $200 in gold hidden in the corner of the drawer -- and fled. Less than an hour later, about the time it would take to walk from the saloon on Central Avenue, Officer David Brooks, 38, of the University Station and a seven-year veteran of the police department, was walking north on Grand Avenue, approaching 30th Street. Because of numerous recent burglaries in the area, police officers had been patrolling the area for several nights in plain clothes. Brooks was approached by two young men wearing black clothes and black hats. Unaware that Brooks was a police officer, they pointed their guns at him and ordered him to put his hands in the air. Brooks raised his left hand, and reached for his gun with his right. With that motion, his coat opened and the two would-be bandits saw the police badge pinned to his chest. "He's an officer," said one of the men, according to witnesses. "That's nothing," said the other. "Hold him up anyway." When the two men saw the gun in Brooks' hand, they opened fire. One bullet hit Brooks in the left side, just below the ribs, and exited on the right side in the same position, cutting through his intestines and liver, and severing an abdominal artery. After he was hit, Brooks leaned against a telephone pole, then fell to the sidewalk as he emptied his gun at the fleeing bandits, but didn't hit them. They returned fire as they ran, firing more than half-a-dozen shots toward the fallen officer. Alerted by the gunshots, a crowd of more than 20 people from the neighborhood gathered around Brooks, including a physician, Dr. Thomas E. Taggart, of 2834 S. Grand Ave. He examined Brooks, and sent someone to call for an ambulance. As Dr. Taggart realized how serious Brooks' injury was, he decided to flag down a passing car to take Brooks to the Receiving Hospital. "If only I had been a little quicker, I would have got those fellows," Brooks said during the drive to the hospital. "I ought to have got 'em, but I was a little nervous, I was a little shaky ..."
The driver of the car didn't know where to find the entrance to the Receiving Hospital, and stopped at the entrance to the Central Police Station on 1st Street, where Capt. Avery Bradish helped to carry Brooks around the corner to the hospital entrance on Hill Street. "I did my best, but was not quick enough," Brooks told Bradish before he died, about 10 minutes after arriving at the hospital. Brooks was born in March 6, 1872 in Ohio, the oldest of five children or James K. Brooks, a farmer, and Jane Gettinger Brooks. By 1896, Brooks was in Los Angeles, working as a streetcar conductor. In 1898, he married Ottilie M. Vogt, a native of Illinois, and they had three sons -- David Jr., born in 1899; Walter, born in 1901; and Frederic, born in 1903. In early 1903, at about the time their third son was born, Brooks joined the LAPD, and was assigned to the University Station. After Brooks was killed, police officers rounded up all the usual suspects -- including a young man who was released from the Whittier Reform School on the day of the shooting, and was arrested three weeks later in Maricopa, Arizona, wearing woman's clothing. All of the suspects were questioned and released. In May 1910, the LAPD hosted a concert and ball, with proceeds to benefit Brooks' widow and three young children. The event, held at the Goldberg-Bosley Assembly Hall, at 16th and Flower streets, drew nearly 3,000 people, and raised an estimated $4,000 -- about $100,000 today. Police Chief Alexander Galloway and L.A. Mayor George Alexander spoke at the event, which featured orchestral music, a skit and dancing. The hunt for Brooks' killers continued for months, but eventually all trails ran cold. His death was the first of three killings of LAPD officers that remain open and unsolved. 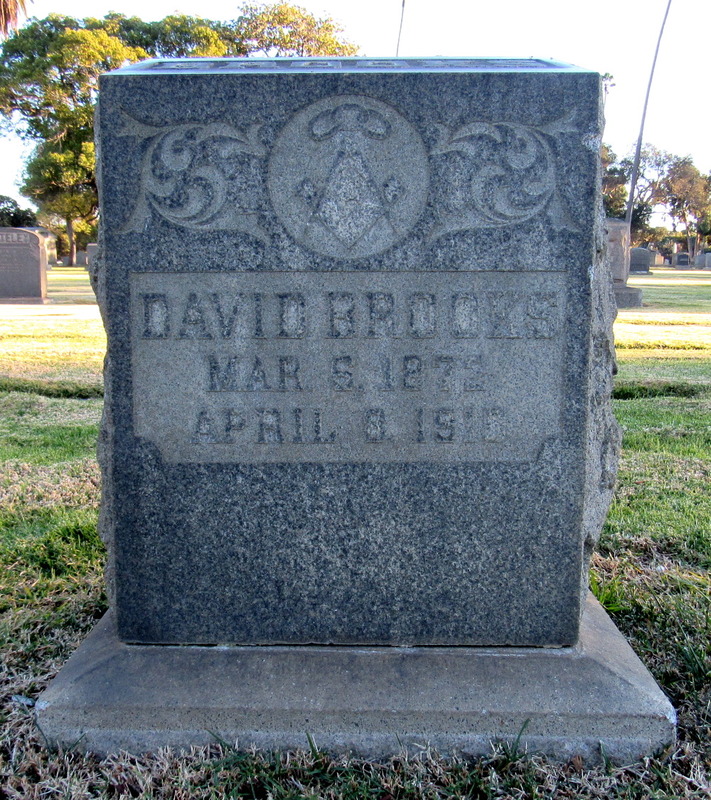 Brooks was buried at Inglewood Park Cemetery. 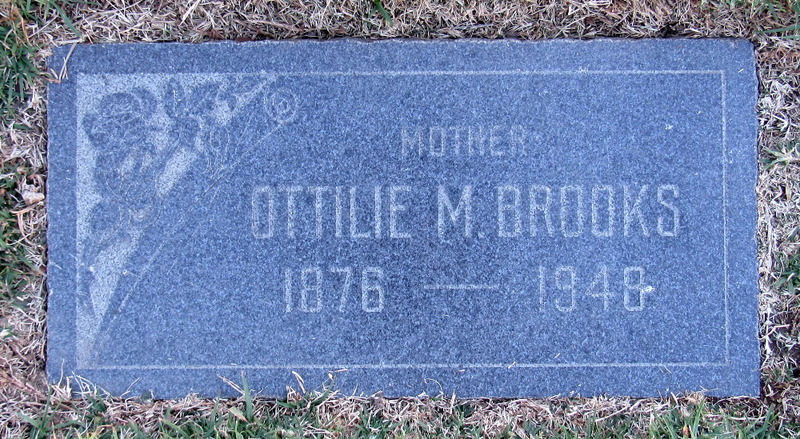 His widow, Ottilie, died on May 14, 1948 in Los Angeles, at the age of 71, and is buried next to her husband. Brooks' sign is located at the southwest corner of South Grand Avenue and West 30th Street.